Attendants wearing fibulae, Emperor Justinian Mosaic (detail), San Vitale, Ravenna (Byzantine), c. 546-56 C.E. Ornate fibulae became all the rage in the early middle ages (c. 500 – 800 C.E. ), and are one of the most commonly found objects in barbarian grave sites. The word “barbarian” comes from the Greek word barbaros, meaning “foreign,” so it is often used as a blanket term for the non-Roman groups who migrated into western Europe in the early middle ages (such as the Ostrogoths, Visigoths, Franks, and Lombards). This was the time when Europe was becoming Christianized and the Roman Empire split apart. The Roman Empire ceased to exist in the west, but continued in the east as the Byzantine Empire, with its capital at Constantinople (modern-day Istanbul). This period is also sometimes referred to as the Migration Period. Sparse written documentation of these people survives, so grave goods like fibulae provide the most concrete cultural information available. This gold fibula was made in Rome or Constantinople in the 5th century and is called a crossbow fibula because of its resemblance to the weapon. Unscrewing the left knob at the end of this “crossbow” would release the pin. This Lombardic fibula found in Kranj (modern day Slovenia) provides a good comparison, because it is a stylized variation of the crossbow fibula. It features at one end a semi-circle from which radiate nine rectangular incised forms topped with spheres (this type of fibula is called “radiate-headed” or “digitated”). 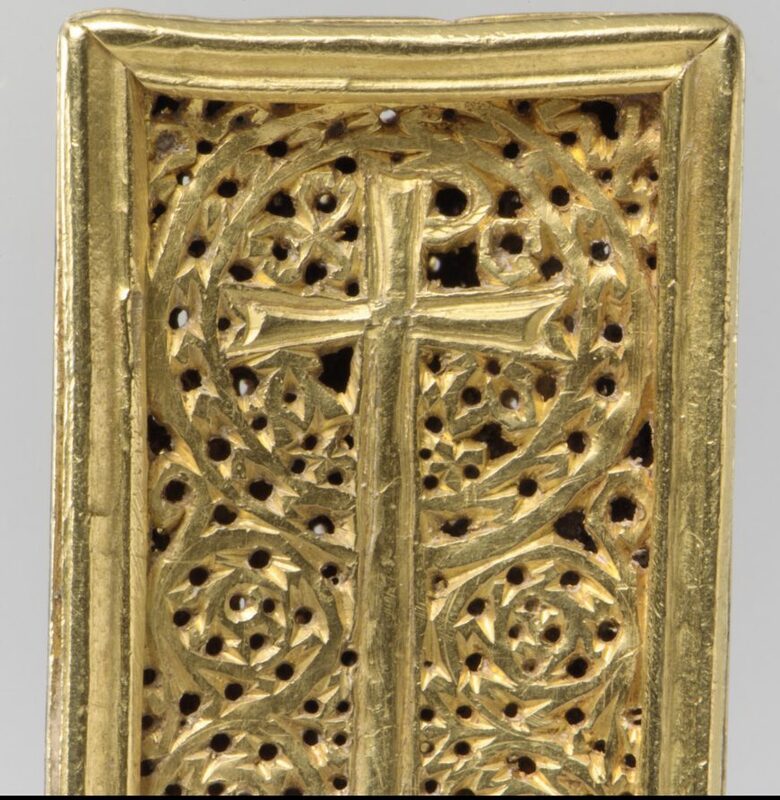 It is gilded and inlaid with niello, a black metal alloy. The incisions are hatched lines—a popular decoration technique in Lombardic fibulae. Lombard silver bow fibula, gilded, with inlaid niello and engraved decoration, mid 6th century C.E., found in Kranj, 11.3 cm. long (National Museum, Slovenia). Photo from the internet archive. The Lombards (or Langobards, from the Latin Langobardi) are thought to be of Germanic origin, although their background is still contested. They established their kingdom in Italy in 558 and were defeated by Charlemagne, king of the Franks, in 774. This pair of Merovingian fibulae is a good example of cloisonné, a technique that was popular in barbarian art. This technique is characterized by inlaid semi-precious stones. The word cloisonné literally means “partitioned” in French. The artisan would solder wires onto a metal base and fill the areas created with polished stones (this is different from cloisonné enamel, which has colored enamel baked within these partitions). This example also shows a popular motif in barbarian art of the middle ages—eagles. The eagle was a symbol of the Roman empire and was adopted at this time because it still carried connotations of status and power. 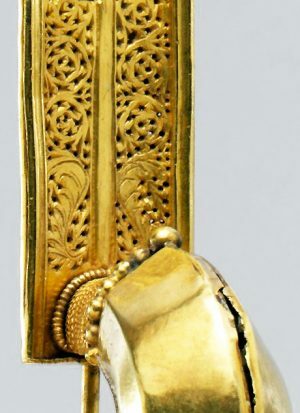 The top end of these fibulae are in the shape of eagle heads and a series of similarly stylized eagle heads can be seen creating the loops on the opposite end of each pin and on the sides. A small fish decorates the main body of each of the brooches. Garnets were used for the eyes of the eagles, and a wide range of gems were used in the rest of the fibulae. These stunning objects demonstrate the remarkable skill of barbarian metal workers during the early middle ages. This pair of Visigothic fibulae in the form of eagles provide another good example of barbarian metalwork and cloisonné. They are decorated with garnets, amethyst, and colored glass and were found at a Visigothic grave site in Spain. They likely would have fastened a cloak at the shoulders and pendants may have hung from the loops at the bottom. Florin Curta, The Making of the Slavs: History and Archaeology of the Lower Danube Region, c. 500-700 (Cambridge University Press, reissue edition, 2007), p. 247. Barbara Deppert-Lippitz, “A Late Antique Crossbow Fibula in The Metropolitan Museum of Art,” Metropolitan Museum Journal, vol. 35, p. 41. Florin Curta, The Making of the Slavs: History and Archaeology of the Lower Danube Region, c. 500-700 (Cambridge University Press, reissue edition, 2007), p. 274. From Attila to Charlemagne: Arts of the Early Medieval Period in The Metropolitan Museum of Art (The Metropolitan Museum of Art, 2000). Florin Curta, The Making of the Slavs: History and Archaeology of the Lower Danube Region, c. 500-700 (Cambridge University Press, reissue edition, 2007). Pete Dandridge, “Idiomatic and Mainstream: The Technical Vocabulary of a Late Roman Crossbow Fibula”: Metropolitan Museum Journal, v. 35 (2000). Barbara Deppert-Lippitz, “A Late Antique Crossbow Fibula in The MetropolitanMuseum of Art,” Metropolitan Museum Journal, vol. 35, pp. 39-70. Cite this page as: Rebecca Mir, "Fibulae," in Smarthistory, August 8, 2015, accessed April 24, 2019, https://smarthistory.org/fibulae/.